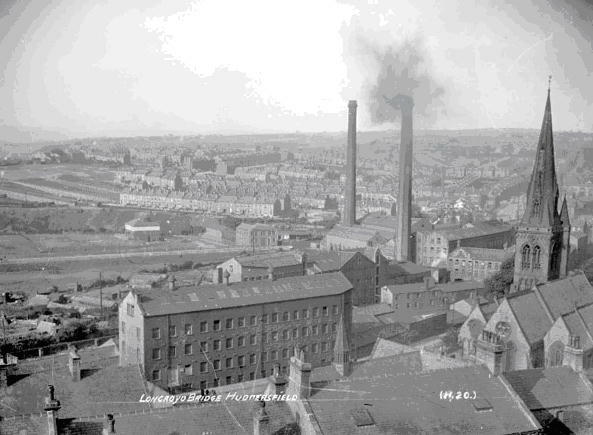 In 1819, on a narrow strip of farmland at Longroyd Bridge, bounded by the curve of the canal on the north and the river Colne on the south, Starkey, Buckley & Co. began to raise what became for many years the largest woollen factory in Huddersfield. It is one of the ironies of Huddersfield’s history that , only yards away, stood the cropping shop of John Wood, where seven years earlier the Luddites had planned their campaign to halt the advance of machinery. Thanks to the staff of Huddersfield Local History Library and Kirklees Archive Service for help during this research. 1. Directory 1822, 1830; For date of original mill Factory Commissioners Report, 1834; Thos Walker Brook , Parliamentary Committee on LNWR, in Huddersfield Examiner (Weekly) (HEW) 15 May 1874; The Worker 16 Mar 1907. 2. Leeds Times (LT) 21 Feb, 9 May 1835; HE 2 Apr 1853. 3. Leeds Times (LT) 21 Feb, 9 May 1835; HE 2 Apr 1853. Jenkins D.T. The West Riding Wool Textile Industry 1770-1835 (Pasold 1975) pp.166-168; For a reconstruction see RCHM, Yorkshire Textile Mills 1770-1930 (HMSO 1992) p102. 4. Voice of the West Riding 23 Nov, 28 Dec, 27 Jul 1833; Pioneer 1 Mar 1834; HEW 15 Jan 1881; George Brook [obituary]. 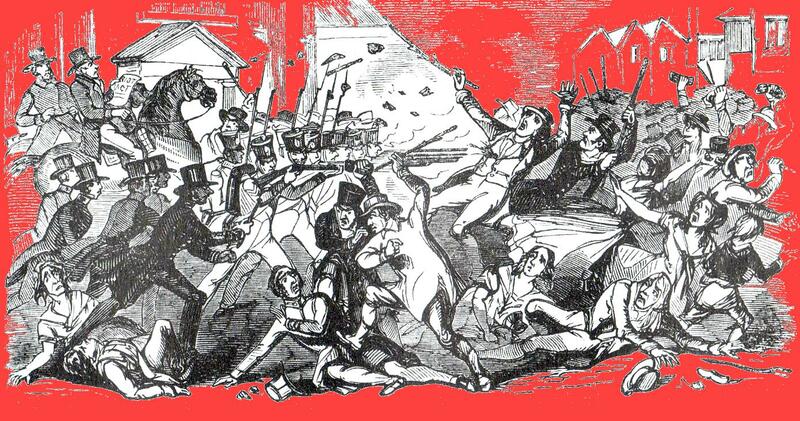 )LT 14,21 Dec 1839;New Moral World 28 Jun 1845 ; Leeds Mercury (LM) 20 Aug 1842. 5. LM 13 Apr, 4 May 1844; HE 2 Apr 1853; LM 30 Sep 1848; HE 31 Mar 1860. 6. HE 30 Aug 1975 Chadwick,.S. ‘The Starkeys and their Church’. LM 29 May 1847, Sykes D.F.E. History of Huddersfield p. 149; LM 13 October 1849; LM 6 Apr 1850; HE 31 Jul 1852. 7. Huddersfield Chronicle (HC) 5 Jan 1861; 14 Jun 1862; 14 Mar 1863; HEW 24 Jan 1874; Huddersfield Weekly News 18 Apr 1891. Yorkshire Factory Times (YFT) 18 Jan 1895. 9. West Yorkshire Archive Service, Kirklees KC.135; LM 30 Jan 1849; HEW 31 Jan 1903, T.W.Brook, obituary. The name Springdale first appears in the 1897 White’s Directory. 10. HEW 15 May 1875, Brook explained that the mill relied on water from the canal for its operations. ; 10 Jul 1869; 12 Apr 1873; 29 Jun 1887. 12. HEW 11 Apr 1874; YFT 18 Jan 1895. 13. LM 17 Apr 1841; HC 12 May 1860; HEW 19 Jul; 15 Oct 1904. 14. The Worker 16 Mar, 27 Apr 1837; KC 135 Sales advert and plan; The Worker 28 Jan 1911. 15. Yorkshire Textile Directory 1910 et.seq. thanks for your inquiry. I don’t have much on Titanic sine my main study of local mills only goes up to 1914 and the mill was built only in 1912. I attach the references I have below. There is some later stuff about the CV Spinning Co but I don’t have this typed up yet. I have more stuff on Washpit if you are interested in that, but Michael Day has use much of it (and more) in his book on Holme Valley mills ‘Wool and Worsit’. 1911 CVG 27 Jan: Beaufort Mill chimney felled, ‘a large mill is being erected on the site for the Colne Valley Spinning Company. The new chimney will be about 60 yards high and will be erected within about two yards of the site of the old one.’ Contractors, J. Wimpenny & Co. Linthwaite. 1912. W 10 Feb: during building 40 iron pillars on the ground floor fill with water and are cracked by frost. Lockwood. P22. CV Spinning Co. Founded by J E Crowther. Floor space 22,691 sq yds. 1914. YFT 8 Jan: Colne Valley Spinning Co (Linthwaite) strike of 20 spinners: not in union: but join: bad mterials : only average 8-9s a week after paying piecers. All dismissed and new hands advertised for. W. 17 Jan: fund raising. Locked out new year’s eve. 1915. YTD : Colne Valley Spinning Co. 21,000 spindles. Hi. 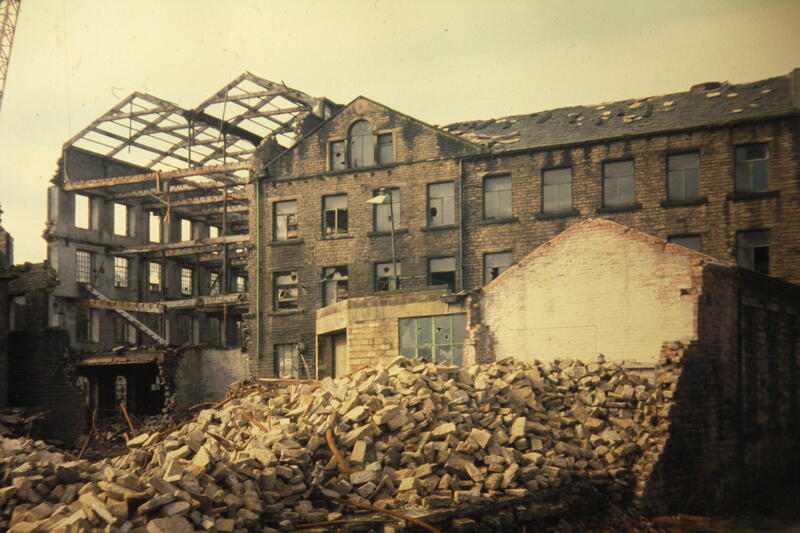 I am currently in the process of renovating Stanley Mill on Britannia Road, Milnsbridge and wondered if you had unearthed any information on this building. We intend to use the heritage of the mill and the area as part of our branding so any useful information would be much appreciated. Many Thanks, Andrew Lindsay. Many thanks. I stumbled on your website in an hour of leisure just wandering/browsing the Internet. Born Huddersfield I have lived in Switzerland most of my life. I am still in involved with textiles and, …. what should I say ? 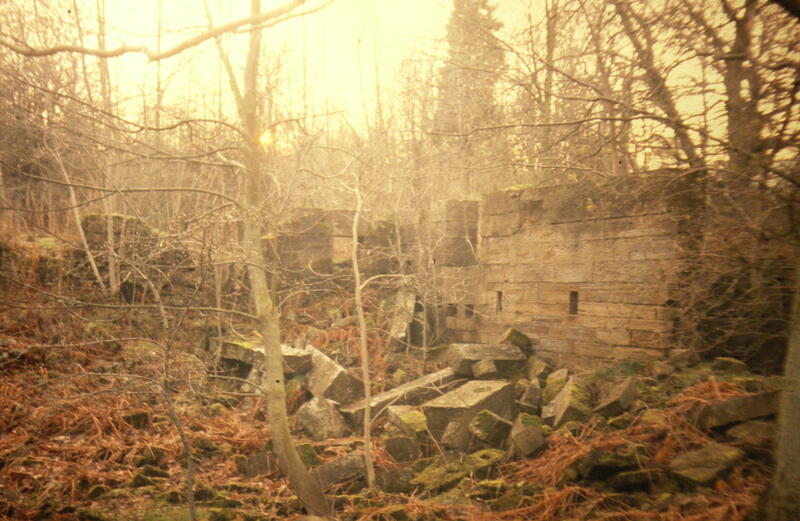 have an interest in the past, present and future of mills in the North of England. As a teenager textile student working for extra money to fund my studies, I worked short periods of time at John Edward Crowthers, Bank Dam Mills Marsden, and Middlemost – Bros., Clough Mill Birkby. In my professional career I have visited and consulted, working on the machines at various mills in Lancashire ,,,, Dorma, Arrowvale, Lonrho Newcastle et al. and also many mills around the world Turkey, South Africa, USA, Finland , Germany, France and so on. I also have a couple of good friends (mill owners) from the Huddersfield District. A long story ! And now, in the autumn of my years my fond memories of Huddersfield and the history of the mills now sadly almost all defunct , I am most interested in obtaining copies of any books , and publications there might be available for sale. What I have on Folly Hall Mills is in the catalogue under ‘Kaye’s Factory’. The only other possible source are the trade directories, not all of which I have searched for every mill. I work at a company called the Design Bank and we are based in a building called ‘Headrow House’ located on Old Leeds Road on the bottom end of town, that we believe is a converted old textiles mill. We’re sat roughly inbetween Waterloo Mills and Turnbridge Mills, next to a converted church. I was just wondering if you had any information about the history of the mill building, such as the year of it’s contruction and what it was originally called. I’ve had a look online and can’t seem to find a map of the town detailed enough to show it’s old name and such, but I did stumble across your site in the process. Any help would be very much appreciated! Thanks in advance, keep up the great work. Gaye, Have you searched through the ‘Catalogue of Mills..’ pages ? My late father worked at John Crowthers Milnsbridge, he started as an office boy, through hard work and going to tech he gained his ACIS and ACIA and became the company secretary, I worked in all the school holidays in the joinery shop and metalwork shop, so went all around the mill complex, I was there when the first Sulzar looms came from Switzerland,the floor had to be re-laid to be perfectly flat, I helped in getting these big (to me) machines in place, this was the era of Joe Hymen, my dad was often whisked down to London at a moments notice in the company Rolls Royce, my dad prefered the new Audi 100Ls that they had just bought. It was also the unrest in Ireland and my dad decided to move on after over 40yrs. Thanks, Alan, for this information. ” …. I left school at 14yrs. I wanted to go into Shop work but my Dad said it was the was the MILLS for me- so I started work in a WOOLLEN MILL- and had to begin at 7-15am until 5-15pm with half hour for dinner time – I had to learn to wind the BOBBINS for the weavers to fill their SHUTTLES and my wage was 5/- a week, and then I got 8/- a week. I didn’t like in the MILL, but I had to stay there- a girl who worked with me, said we ought to move on – but we were told we could learn to weave on Northrop looms- and we had three hours each – it was very hard work and we only got paid 13 shillings at first – Then we were 16 and asked for a little extra and we got 21 shillings! Milnsbridge a large mill – John Crowther and Sons , and so we started work there. Thankyou for this interesting information. I am currently engaged in writing a book on my family history, which is primarily intended for my daughter, sister and some other family members to give them an insight as to the lives of their ancestors. I am descended from William Learoyd, who was a woollen mill owner in Huddersfield, and one of his later descendants, Alfred Ernest Learoyd was instrumental in designing and building Trafalgar Mill. I was wondering if there are any remaining employees of this particular mill still living, with memories of the tasks they carried out, along with and their working conditions. I do not live in Yorkshire, and can rarely make the trip to Huddersfield owing to family constraints, so any contribution would be greatly appreciated and welcomed. How do I contact Alan Brooke to thank him for his research on “Mills” [esp. REF:103 Dobroyd] where my grandfather, Benjamin Kitson [& his Business Partner Charles Sharman] were short term owners/leases in 1900’s? And, how do I discover how many people would have been employed in a Mill of 70 looms and 2,000 spindles? This is for my family not-for-profit website being http://www.amos-denison.life NB: This is a real “modern” website and the address is 100% accurate – some web/blog pages need updating to accommodate such an address!